Here is something you might not know about me: I LOVE TV. I don't really understand people who don't like TV, recently when talking to a pseudo intellectual they told me they don't have a TV - later in the conversation they mentioned how they were watching something on the Internet... now hang on a second that's the same thing buddy. To me not liking TV is like not liking music, it just confuses me, I mean our hearts beat... that means we literally need music to stay alive. I am not a snob about TV. I watch a wide range of shows (far too many) but don't tend to watch reality TV - yeah that's right I am one of the people who will be out of the loop of conversation from now until Christmas as I don't watch X Factor. Its a weird time of year - our summer TV programmes have finished (True Blood, Pretty Little Liars, Burn Notice, Suits) and we are waiting for the new seasons to start. Last week I was a bit sick (thank god I had a bit of weight on me for illness -- well I actually have enough weight on me for a couple of people's illnesses but the less we say about that the better) and when I started to feel better I took to the Internet to see did I miss any good TV programmes. To start I watched Alcatraz made by J. J. Abrams (the evil genius behind Lost) and it's basically Lost on the island of Alcatraz. Prisoners who mysteriously vanished in 1963 are re appearing, each episode features a different prisoner and their story. I really liked Alcatraz but if you're looking for answers you won't get them, it will leave you as flummoxed as Lost did. Alcatraz was cancelled so some of you might not want to waste your time watching it. I have visited Alcatraz (it smells like pee) and I really enjoyed how each week you would see a different story. Another programme I have to talk about is Hell on Wheels, it's based on the building of the transcontinental railroad in 1865 and it is GOOOOD. Hell on Wheels is made by AMC which also brought us Mad Men and The Walking Dead. AMC where men are men and women are ....well basically whores. 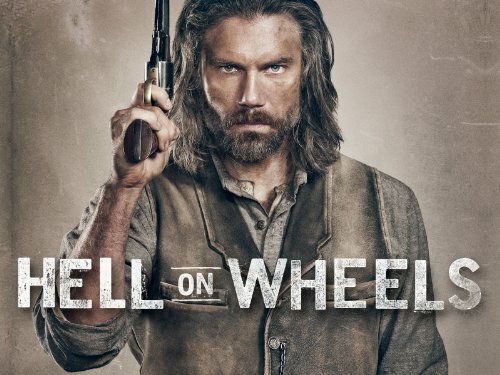 While Mad Men gave us Don Draper, Hell on Wheels gives us Cullen Bohannon, a former Confederate soldier and big ride who is out to avenge the men who killed his wife, while looking moody and gorgeous and man can he wear a gun belt. Rather hilariously Cullen Bohannon is played by Britney's love interest from her critically acclaimed (ahem) movie Crossroads... sure isn't life gas altogether. The man has dimples so deep you could swim in them.... oh yeah it's set in the wild west and there is shooting and fighting and Colm Meaney as the business man trying to build the railroad. This is one of those programmes that men will love and women will love it too (if you ignore the fact that besides whores there are not many female characters) - check it out and let me know what you think. So what TV programmes have you been watching? and more importantly what programmes will you be watching when they return?